APDS was developed by engineers working for the French Edgar Brandt company, and was fielded in two calibers (75 mm/57 mm for the Mle1897/33 75 mm anti-tank cannon, 37 mm/25 mm for several 37 mm gun types) just before the French-German armistice of 1940. The Edgar Brandt engineers, having been evacuated to the United Kingdom, joined ongoing APDS development efforts there, culminating in significant improvements to the concept and its realization. British APDS ordnance for their QF 6 pdr and 17 pdr anti-tank guns was fielded in March 1944. 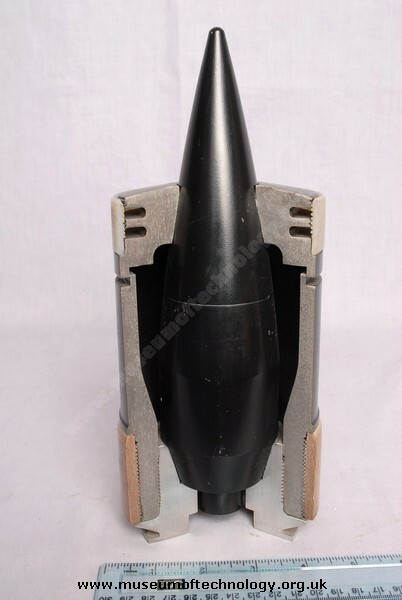 L52 APDS-T for the L7 105 mm Tank (TK) gun. Couldn't tell you which variant it is (A1, A2 or A3) though.